This, the first version of Tetris on the NES, was pulled off of the shelves only 1 month after it’s debut and is therefore one of the rarest NES games released by a major publisher. Atari had licensed the game from British software publisher Mirrorsoft, who themselves had been granted a home console license from Tetris designer Alexey Pajitnov. Unfortunately, because the license was granted by Pajitnov himself and not the Soviet ministry of software and hardware export (ELORG), the contract was considered void and the home console rights to Tetris were granted by ELORG to Nintendo. Atari sued Nintendo unsuccessfully, and all unsold copies of the game were ordered to be removed from stores and destroyed. This was unfortunate, as many Tetris aficionados consider this to be the superior of the two versions of Tetris on the NES. The main difference between the two games is the ability for two players to directly compete in head-to head competition. The two players (or 1 player versus the computer) face off on a split screen and compete for high score. If one player fills their stack to the top, then their game is over but the other player keeps going until they suffer the same fate. When the first player’s game ends, they may start a new game on their half of the screen while they wait for the other player to finish. The game also features the standard 1-player mode, in which case only half of the screen is used. Also included is a co-op mode in which 2 players both work on the same stack. As with regular 2-player mode, it is possible to play co-op along with the computer, but as the computer is an exceedingly slow player multi-player modes are best left to times when you have a friend around. Visually, the game maintains an excellent Russian flavor, including images of the Kremlin and Russian dancers coming out between each level, absent from the Nintendo release. The inclusion of 4 traditional Russian songs complete the package. 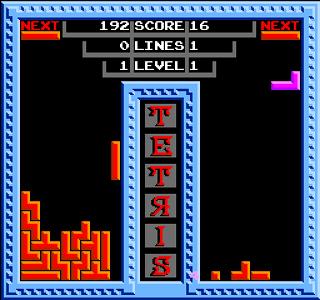 In terms of gameplay, Tengen Tetris is spot-on. It is a based on the original Atari-released arcade game, and has excellent speed and distribution of game pieces (called tetronimoes.) The only criticism I have is that the pieces are very plain-looking and lack any kind of flair or detail unlike the Nintendo releases, but this is more than made up for by the overall presentation of the game. Other than this one minor issue, Tetris: The Soviet Mind Game is the definitive port of the greatest puzzle game of all time, and is absolutely worth the price it commands. Buy Tetris: The Soviet Mind Game on GameGavel or Amazon. Tagged Arcade, Atari, NES, Nintendo, Puzzle, Tengen, Tetris. Bookmark the permalink.